UNFCCC/James Dowson COP24 closing plenary meeting in Katowice, Poland, 16 December 2018. The focus of this year’s climate conference was on agreeing the ‘Rule Book’ which provides more clarity to governments on how to implement the Paris Agreement. As might be expected from a negotiation between almost 200 parties, compromises were necessary. This primarily related to the most vulnerable countries accepting that although global ambitions to reduce emissions are not yet where they need to be, they recognised that this push will continue and now has the weight of the UN Secretary General behind it. Without ‘US – China’ superpower talks dominating the conference, it gave other countries a chance to club together to push for some of the more critical aspects, such as clear reporting of emissions, something China has resisted in the past. Brazil refused to accept stricter rules on using carbon credits that would have prevented the double counting of carbon emissions – an issue that will be essential to unlocking finance for securing natural carbon sinks. That will be a battle for another time. And as Brazil has pulled out of hosting COP25, perhaps the conversation will fall on more neutral ground in Chile who have stepped forward as replacement hosts next year. Whilst the ‘Rule Book’ negotiated in Poland does not satisfy everyone, it provides a useful foundation for the work that will be now done to raise ambition and drive accelerated action from those capable of doing so – a message that was heard at several of the side events taking place in Katowice. UN Secretary General António Guterres offered a strong and clear message at the opening of COP24. He did not shy away from pointing out the life and death challenges already being caused by climate change, but he also clearly laid out the solutions and the sense that the problem can be fixed with the right response. He also stressed that he will use next year’s UN Climate Change Summit to deliver “three key outcomes: raising real ambition; transformative action in the real economy; and an unprecedented citizen and youth mobilization”. Guterres’ presence helped to bring home the point that the discussion in Poland was not not just about national governments – but goes beyond that to recognise the role of business, cities and citizens over the coming years. 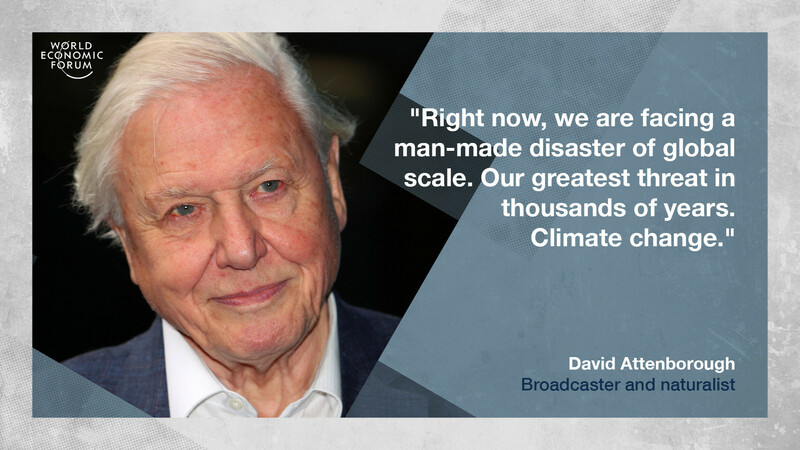 David Attenborough also gave a rousing speech at the beginning of the conference, in which he highlighted the urgency of tackling climate change and why this is so critical for nature as well as for humanity. The role of nature as one of the huge opportunities for tackling climate change will be one of the main threads of the World Economic Forum’s annual meeting in Davos next January. The role of non-state actors in achieving the emissions reductions needed to deliver the Paris Agreement played a critical role in bolstering the sometimes abstract conversations taking place in Katowice. One of the world’s largest shipping companies, Maersk, announced a jaw-dropping commitment to become carbon neutral by 2050 – a goal that all businesses must ultimately achieve, but one that few of the ‘hard to abate’ sectors have stated publicly until now. Maersk’s fleet carries around 80% of global trade, and a shift to carbon neutrality will have huge repercussions across their value chain and will undoubtedly inspire others to start believing that the impossible is not so any longer. This was also the key message from the Energy Transitions Commission. Their latest report, Mission Possible, states that it is technically and economically feasible to reach carbon neutrality by 2050 in the cement, steel, plastics, shipping, trucking and aviation sectors. This sends a clear signal to businesses and governments that nerve may be the only thing standing in the way of delivering the necessary solutions for what are perceived as the trickiest areas of the economy. These voices are likely to grow louder over the coming months, with a push to demonstrate real progress in time for the UN Climate Summit in September 2019. There were the inevitable signals from those still wedded to the old economy that there is a future for fossil fuels. A US side-event pushing this agenda was stormed by protestors, but the battle continues in many countries that still see coal as the cheaper and easier option. This may not be the economic reality, but it is still the political reality for many and work is needed to shift investment incentives in favour of clean technologies. The need to truly ensure a just transition was a critical message that came across loud and clear in Katowice, where 37 states signed up to the Solidarity and Just Transition Silesia Declaration, which underscores the need for workers to be at the heart of the process of the shift to a clean economy. “This declaration means that workers and their unions will have a seat at the negotiating table and workers’ voices will be heard when climate policies are developed and implemented,” said B Team Vice-Chair and International Trade Union Confederation General Secretary Sharan Burrow. The star of COP24 was Greta Thunberg, the Swedish teenager who spoke truth and wisdom throughout the summit and inspired others around the world to join her school strike. Given the urgency of the climate crisis, it is not surprising that a surge in social justice movements is starting to emerge. From the French ‘gilets jaunes’ (yellow vests) protesters pushing back against unjust fuel taxes (recognising the need for climate action, but pushing back on the costs being borne by those least able to pay) through to Extinction Rebellion, an international social movement campaign for radical change. In the US, meanwhile, the Sunrise Movement is pushing back on government policies that do not protect future generations. The overall mood coming out of Poland was one of hope – but it was also defined by an increased urgency to deliver what future generations are demanding.